When J.R.R. Tolkien penned The Hobbit, which was published in 1937, he couldn't have known that he was beginning one of the most famous and beloved story cycles the world has ever known. Its initial popularity prompted his publisher to ask for a sequel and Tolkien started writing The Lord of the Rings, which turned out to be a huge opus requiring twelve years for completion - and history was in the making. By the time of Tolkien's death in 1973 The Lord of the Rings had a huge word-of-mouth cult following, with many popular editions, and was part of the cultural background for youth and adults of all ages (one index of its cultural prominence at that time was the Harvard Lampoon spoof edition, Bored of the Rings). Peter Jackson's movie Ring cycle of the Tolkien series has made history again (and is in its own way an achievement in cinema much like Tolkien's in literature, but that is another story) - and has brought Tolkien's writings into a prominence that is perhaps at its peak. Happily, this means that the many foreign editions of Tolkien will probably remain in print for some time, and more may be brought to the fore. 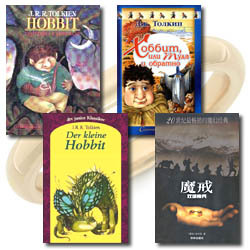 We'll add them as they become available; for now here are the foreign editions of Tolkien that we have been able to find.